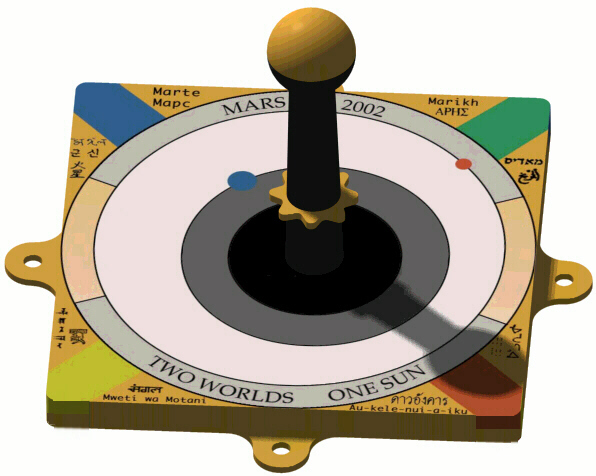 Explanation: When Mars Surveyor arrives at Mars in 2002, it will carry a sundial. Even though batteries and a solar array will power the Mars Surveyor Lander, the sundial has been included to allow a prominent public display of time. The sundial idea was the brainchild of Bill Nye the Science Guy, who noticed that a post originally used for camera calibration could be redesigned. Millennia ago, sundials were state-of-the-art timekeepers for humans on Earth. Since the Sun casts similar shadows on Mars and Earth, accurate calibration of the shadow placement on the Martian Sundial will tell a curious inspector of returned images both the time of day and the season.